When we take the Name of Mantralaya Sri Raghavendrateertha Gurusarvabhoumaru the Name of Bichali Japadakatti Sri Appanacharyaru automatically follows to the hearts of the devotees. The greatest and the dearest Devotee. When Sri Gururaya thought of Mantralaya sent a message to Diwan Venkanna that he is scheduled to visit Adoni from Kumbhakonam. The Nawab of Adoni and Diwan Venkannapanth warmly welcomed with great devotion and grandeur. Rayaru happily accepted the kind hospitality of the Nawab Siddi Masoodkhan. Sri Raghavendrateertharu performed the Pooja of Sri Moola Rama Devaru in the house of Diwan Venkanna. Large number of devotees witnessed this Pooja of Sri Moola RamaDevaru by Rayaru. The gratitude of Venkanna cannot be described in words. Rayaru asked Manchale as he has decided to reside there and enter Sashareera Brindavan as per the will and wish of Sri Hari. The Nawab was reluctant to handover Manchale as it was a barren land not fertile, only rocky bed on the bank of Tungabhadra. Rayaru said I want nly this village and nothing more. Rayaru knew the importance of that Siddhi place. So after a few days along with Venkanna Rayaru while coming to Mantralaya from Adoni, the Aparoksha Gnyani Rayaru came to know that, about a mile from Tungabhdara Station. (Now Mantralaya Road), there is Bichali and a great devotee, scholar, HariBhakta, Pratibhapurna is staying in Bichali. Also knew the importance of Japadakatti and the greatness of : Sri Vibudhendrateertharu, Sri Sripadarajaru, Sri Jitamitraru,Sri Vyasarajaru Sri Appanacharyaru’s open University at the Japadakatti.So came to Bichali. Bichali was previously called as Bhikshalaya. Appanacharya a great scholar, though well off with three hundred acres of rich fertile land, his Shishyas grew in large number. Students from all parts of the country came to Bichali to learn and gain Knowledge under the able teaching and guidance of Appanacharya. So his income plan exceeded to feed the students. So asked the Shishyas to take rounds of Bhiksha in the village to all the houses. As per the Upanayana Upadesha it was a noble thing to ask Bhiksha not for lively hood, but for Vidya. It was a Sacred scene to others that all the Housewives were eagerly waiting to offer Bhiksha to the Students of Appanacharya before they were saying Om Bhavati Bhikshan Dehi. All the respectable families regarded the students of Appanacharya. Though Bichali Japadakatti Appanacharya was a staunch follower of Madhwa Atreyasa Gotra - Rayara Mutt and Jahagirdar of twenty eight villages. Jahagirdar of twenty eight villages, with vast cultivation rich and fertile land in between Krishna and Tungabhadra, we can say DO AAB, never showed any greatness nor proud, lived like an ordinary man. This simplicity made him popular as a great teacher. A Guru for all the times. His Bichali Japadakatti on the sacred bank of Tungabhadra under the Ashwath Vruksha. 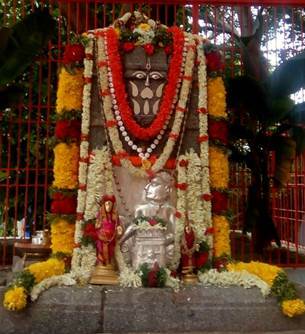 The Gurukula of Sri Appanacharya was nothing but an open university amidst the abundant mother nature’s gift. His prayer, Mantra Siddhi, Kind concern and the thirst of Knowledge, obedience, pleasing disposition made Bichali Sri Appanacharya a Guru of the Japadakatti University. His modesty has further expanded in making rice baked without the help of fire. The washed rice in the sacred Tungabhadra water will be tied in a big cloth something like a jolige, and hangup to the branch of the Ashwath Vruksha, start teaching under the Shadow for two to three hours, after that Appanacharya praying Sri Annapurneshwari will do Prokshana . The rice was baked properly, ready for meals . As per our Sri SriMadacharya’s Sadaachara Pooja, Naivedya, Vaishwadeva, Hastodaka and then used to take his lunch as well as dinner along with his dear students. Appanacharya’s father Sri Ramasubbanacharya, a very noble pious man guided his dear son Sri Appanacharya properly in the right way Sanmaarga. All the Four sons of Sri Narasimhacharya are all are well read, scholars and highly qualified. The second son of Sri Narasimhacharya is our Sri Ramacharya Badadha, a post graduate degree holder in science faculty is the Archaka of Japadakatti staying in Bichali and leading today the :Sri Thirtha Kshetra Japadakatti Bichali Appanacharya Ashtottara Shata Seva Welfare Trust. Abundant devotees are benefitted by Ashtottara at the Sanctum of Bichali Japadakatti, from where Appanacharya started Gurstotra while crossing the Tungabhadra. 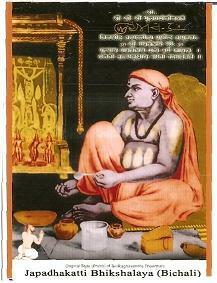 Appanacharya’s devotion, faith, firmness made Tungamma to pave the way. When the time of Brindavana Pravesha Rayaru came to know, first Rayaru dismantled the snake bill which was in the house of Appanna. After him people will afraid of Snake. This snake was none but SheshaDevaru. Prayed a lot before dismantling the snake bill Hearing the Prayer Shesha became a Shila Roopa. Rayaru did the Pratishthaapana of SheshaDevaru at the back yard where the snakebill was there. Devotees we can see today. Dismantling of the snake bill made Appanacharya to suspicion, why Rayaru is Dismantling. After that one day Rayaru asked Appanacharya to go for Madhwa Sanchara owing to the Chaturmaasa. When so many are there! Why Rayaru is asking me to go he could not understand. But Obeyed the verdict of Rayaru and went. After his going Rayaru called Venkanna and announced the day of Brindavana Pravesha on Shraavana Bahula Dwiteeya. In the presence of Appanacharya the Brindavana Pravesha was highly difficult Rayaru knew. He cannot see and tolerate. He knew the Ability of Rayaru and had that much of affect on and liberty that he should have simply brought him outside holding his hand. So Rayaru Purposely sent Appanacharya away from Mantralaya.After sending his dearest devotee, asked Diwan Venkanna to anounce the News of Brindavana Pravesha. Spread like a wild fire, Hearing this shocking news rushed to Bichali and started crossing Tungabhadra from Japadakatti to reach Mantralaya, as he was on the other side of the river. Remembering his Guru, Crying and weeping Went on saying Gurustotra by Ashukavitva, as Appanacharya Knew Rayaru Completely .But by the time Appanacharya reached Mantralaya the last slab was placed and he cannot see his Dear Rayaru. After this he cannot pronounce any thing more. By Gurustotra Pathana our life will be complete with all the requirements and desires will be fulfilled. Gurustotra is Sarvswa to the world devotees today. To attain the Affection Anugraha of Mantralaya Sri Raghavendrateertharu Appanacharya’s Gurustotra is the main source to all of us. Amidst the tens and thousands of names of devotees that crowd the list of devotees the name of Bichali Appanacharya will always shine like the Dhruva Nakshatra. A Stotra and Mangalashtaka, Dandaka, Kavacha are the valuable contributions of Bichali Appanacharyaru. We are highly grateful to Bichali Appanacharyaru chanting this Quick Siddhi MahaMantra QSM we acquire desired things in life by Mantralaya Rayaru.